I’ve found I prefer a bound paper planner for all the work we do together, like our Morning Basket read alouds and memory work, because this leaves me a more flexible format for recording all that learning that happens outside the margins – you know: the feast day cooking and celebrations, the documentaries, the rabbit trails, the impromptu nature walks, the presidential debates with great conversations following. 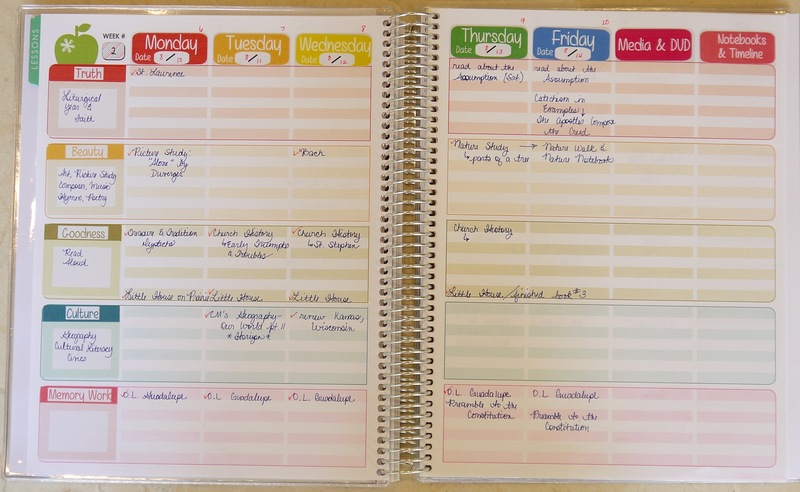 The planner is set up to be used by a teacher in a brick and mortar school with a classroom of kids, but with a few simple edits and changes, I find it works great as a homeschool planner – it contains lots of resource planning pages along with (36) 2-page spreads for planning each week of the year. I used one last year when we had to go back to old fashioned paper planners during our remodel when I had to function lo-tech and I found I really hit a stride by continuing to use the planner for our Morning Basket work. 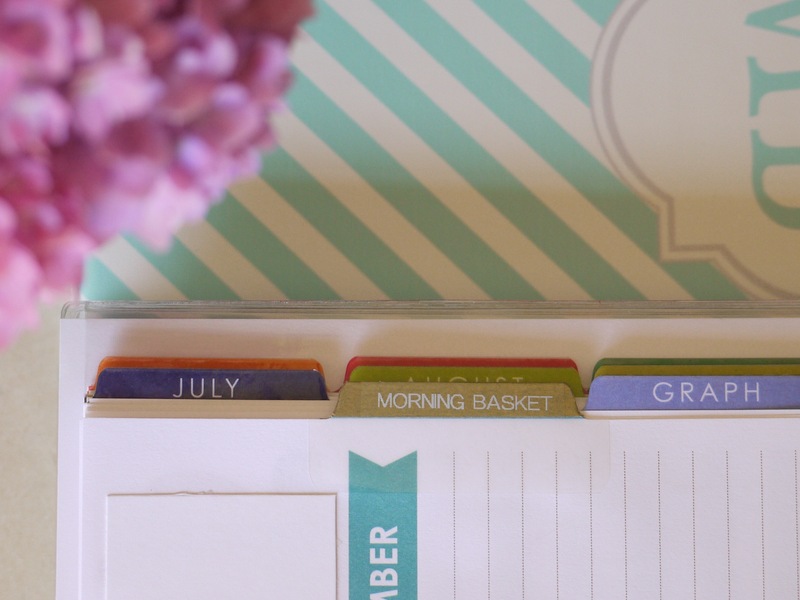 I like the way the planner is set up, and as I’ve shared before: if needed, I can simply grab this planner and let our Morning Basket time (and all of that other very rich, extra stuff) be “good enough” for a day’s work. It’s certainly meaty enough and it’s easy to build on. I thought I’d share a few images of my planner modifications with you. 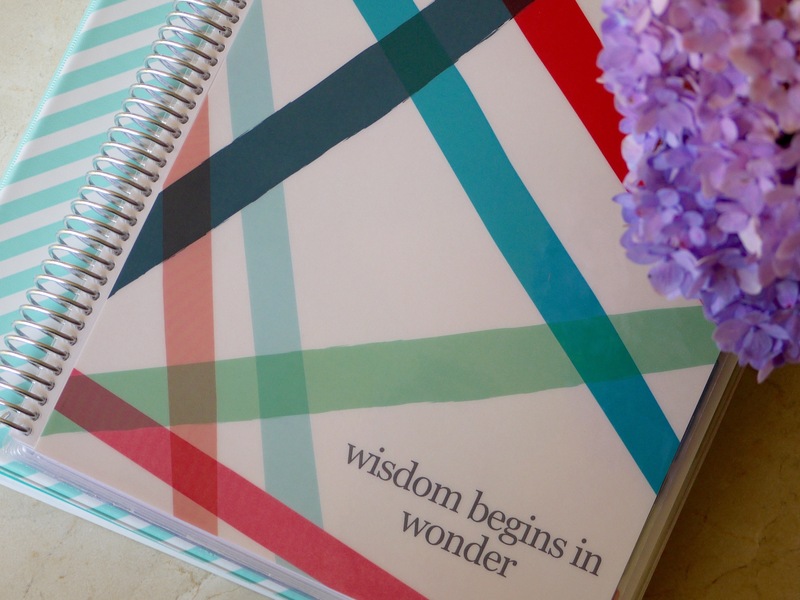 If you find, after reading, that you’re interested in an Erin Condren Teacher planner, just click here and you’ll get $10 off your first purchase. Most of the lesson planner works fine for a homeschooler, but the first few pages contain places for recording information that are school-teacher specific (like a page for substitute teacher info…my substitute teacher is Leap Frog, so I’m all set and Leap doesn’t need a page of further info from me). The very first page is completely useless to me – so I just ripped it out. Others washi-taped that bad boy until it was unrecognizable…but..I didn’t need it, and didn’t feel like plastering that much washi on the page, so out it came! The second page is an example of a page that has a really useful backside, but had places for recording school-teacher specific information on the front side – so I taped a simple calendar that I printed (academic calendar at Donna Young). For the rest of the planner, I just printed my own titles on cardstock (to cover titles on pages that weren’t useful in a homeschool setting), cut them to size, and taped them into place. 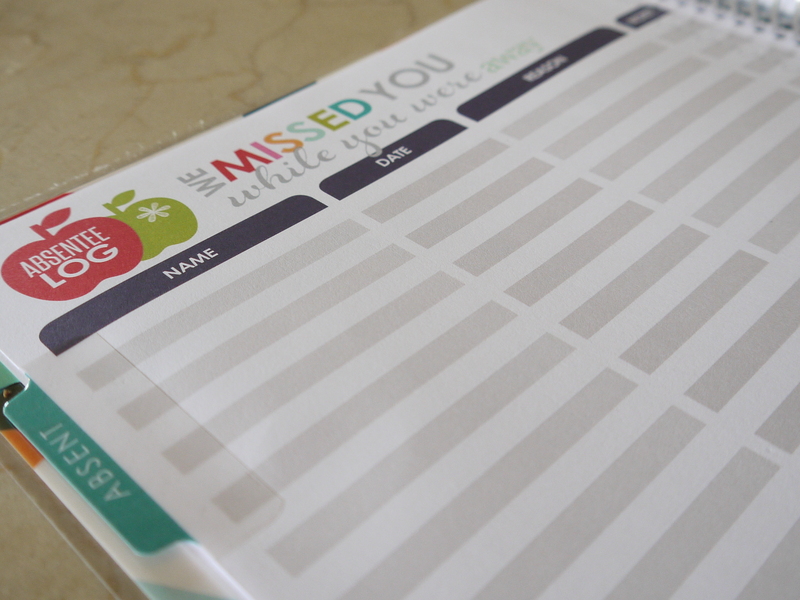 After modifying my lesson planner, I discovered Avery Labels which I’m totally in love with! Design at Avery’s website and print! 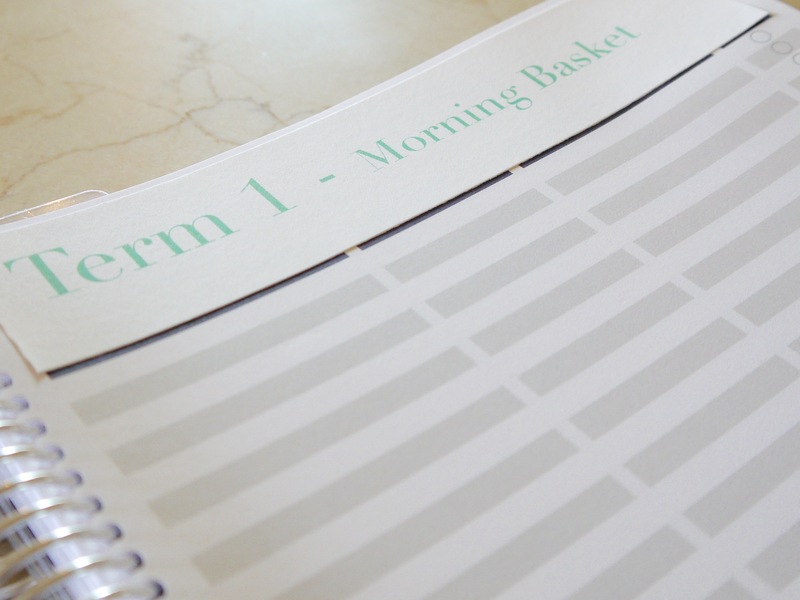 Obviously, I don’t need an absentee log page (or six of them) – but these pages make great places for recording booklists (author, notes, check marks when the book is complete) for each term in our Morning Basket. Sometimes I add in seasonal books or activities that I didn’t initially plan for, and I list them here. Simple fix! And…for the tab that said “absences,” I used some gold washi tape to cover the tab, trimmed it, and then used my label maker to relabel the tab to say, “Morning Basket.” The font isn’t a perfect match, but it’s close enough. 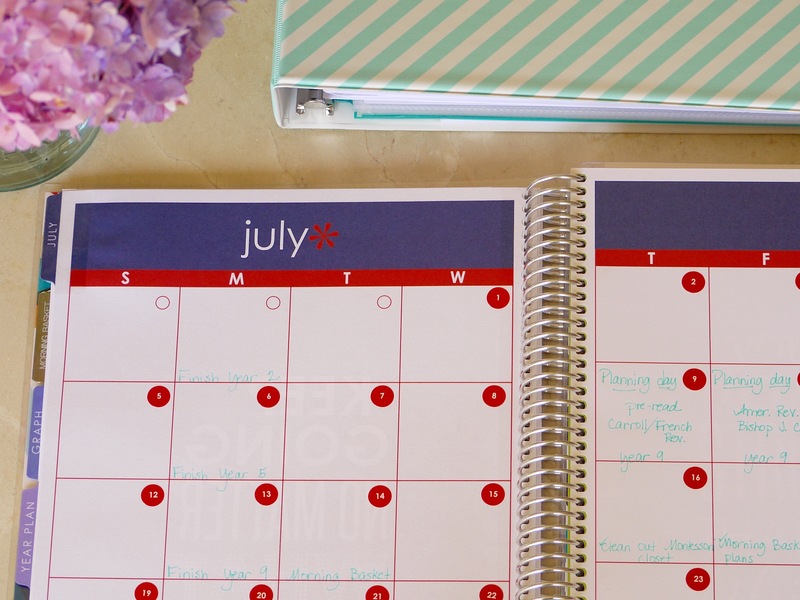 One of the features I love about the planner are the calendar pages at the front of the planner! It allows me to jot down some big picture plans, listing field trips, local events, seasonal highlights, liturgical Feasts I want to be sure to observe. A little pack of date stickers come with the planner so you do have to add those, but I like the bright pop of color each month. I’m not a big “sticker-it-up-gal” – I tend to prefer a more practical planner that features lists and goals, but I do love pretty pen colors! Still…if you do like stickers and decor, these pages are a nice place to add them. A very helpful page is the year-at-a-glance page spread. It’s so helpful to map out the year and list our breaks and holidays. Another feature I really love about the EC Teacher Planner is the option (when ordering) to add sheet protectors to the planner. I always add 3 (the maximum number you can add). And I learned that I can carefully snip the sheet protector and move it around in my planner to a more convenient-to-me location. 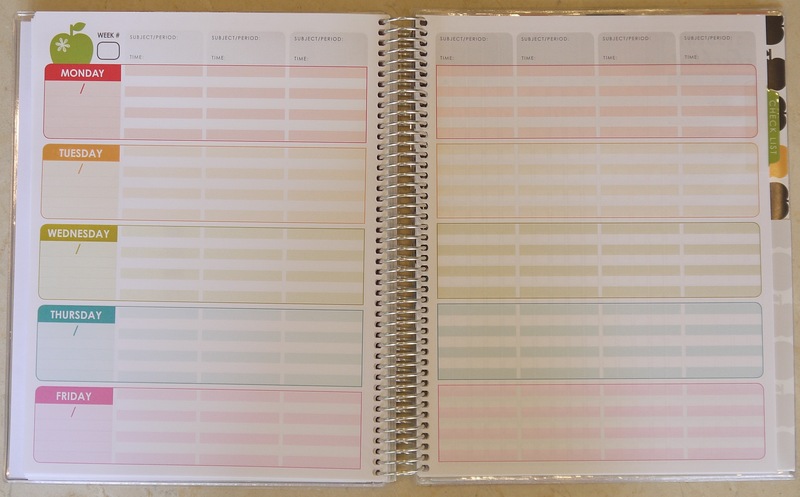 The sheet protectors come attached to the planner in the very back – I move mine around to different places in the planner. They stay in just fine even with the back snipped. I keep pertinent lists, timelines, tables of contents – pretty much any kind of paper resource I’d like to have right at hand in my planner. These sheet protectors will hold several pieces of paper and I find a plethora of ways to use them! 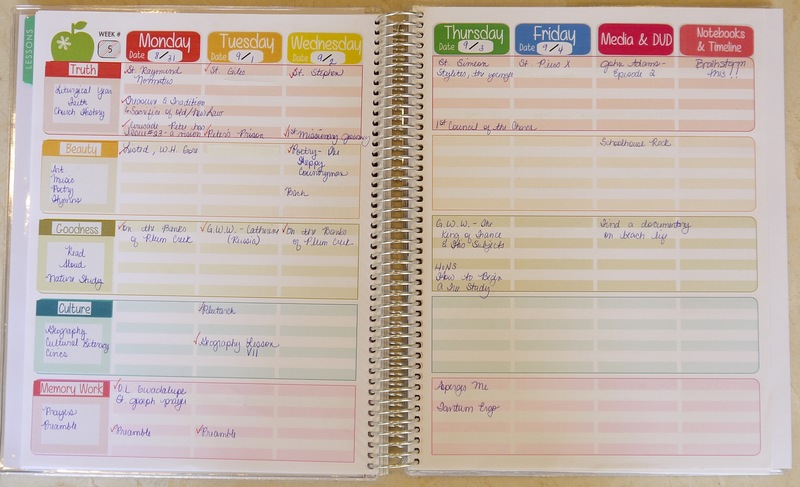 The bulk of this lesson planner looks like the image below – a 2 page spread which has enough space to record one week’s worth of plans and work – which I just fill in as we complete daily read alouds, memory work or other work. 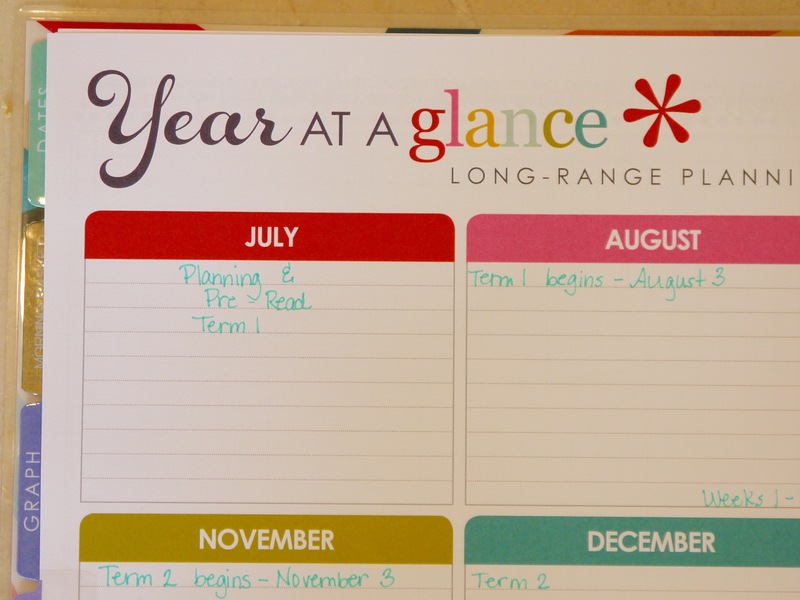 I did manage to squeeze full plans for three of my school age kids in this one planner for a few weeks last year (when I had to because we had no printer/laptop during remodel)…but it about killed me!! 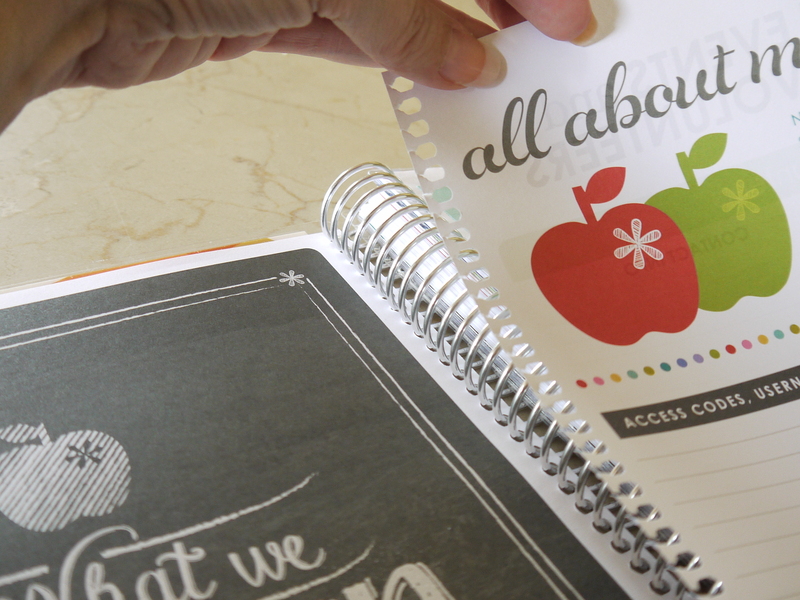 If you’re considering this planner to contain ALL of your lesson plans, it could probably do so for 1-2 children, but if you have more than 2 school age children this planner isn’t large enough to hold everything. I do not use this lesson planner to hold each of my individual children’s daily work any more (I build those in Pages for mac and print their weekly lesson plan grids – easy-peasy). 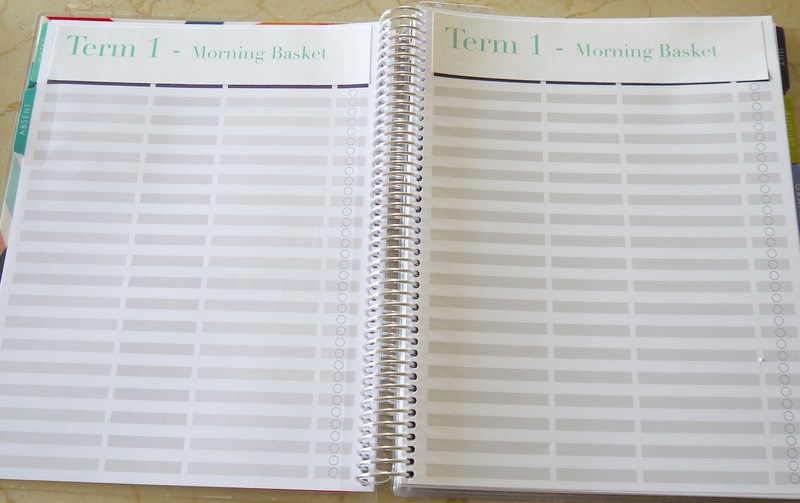 This planner is only for our together work – in the Morning Basket or other learning that happens during a day. You can see that the days are listed vertically down the left and there is room for subjects/periods and time across the top of the pages. This year, I tried something different. I modified the layout of the weekly planner pages. I prefer a different layout (days across the top/subjects down the side) so with the help of an etsy shop – Roc City Creations – the shop owner customized a set of stickers for me. 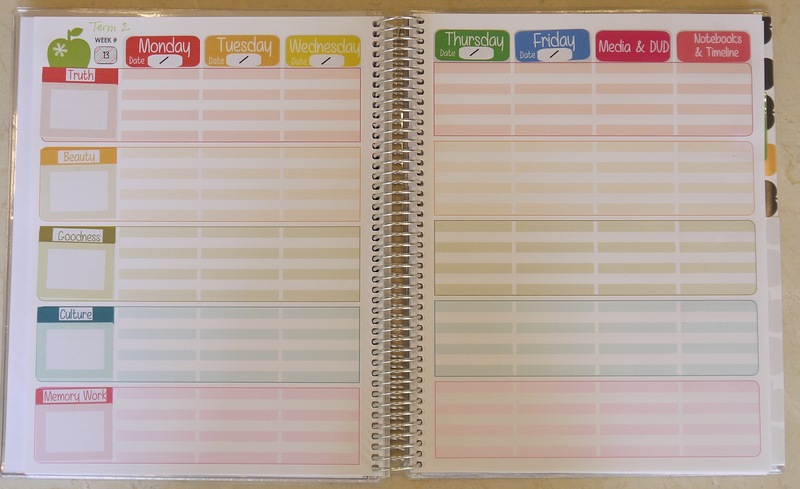 This allowed me to be able to modify every week of my planner so that it was a layout I preferred. Totally customized based on my plans for the year – I love that my subject columns exactly reflect our focus of Truth, Goodness, and Beauty! This days-of-the-week across the top layout is much more intuitive for me! I don’t spend the beginning of each week marking through or covering (sharpie or white out) the pre-printed text in order to write in my own (which is what I did last year). I just open to the week, and start planning/journaling. It takes time to add all of those stickers for 36 weeks! Adding all of those stickers adds more bulk to the pages than I anticipated. It means that the long edge and the top of the planner are actually a little bulkier than the rest of the planner when the book is closed. This isn’t dramatically noticeable, but it is noticeable, and although it’s probably mostly a nit-pick, it does fit in the cons column for me. I’m not sure if I’ll customize the layout again next year. 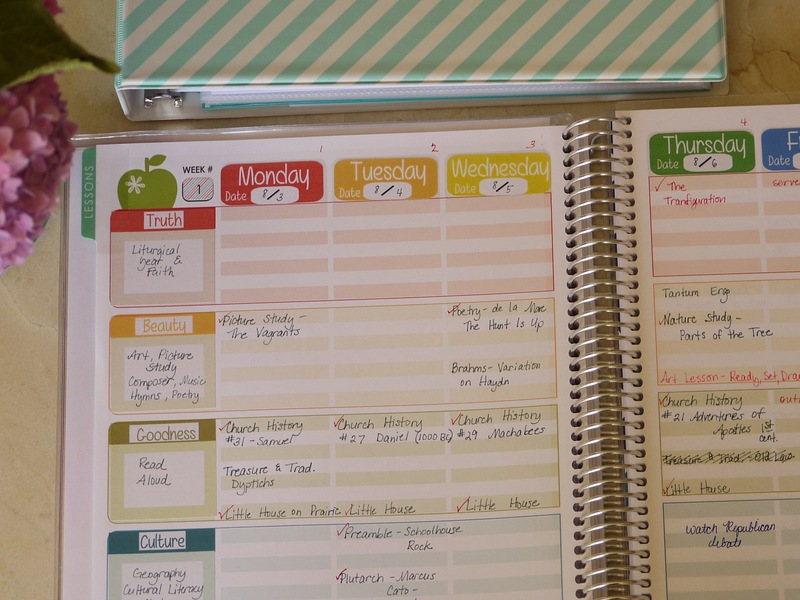 Ultimately, it would be my wish that Erin Condren would allow for some customizations in her teacher planner, especially ones that would make it homeschool friendly right out of the box. I’ve suggested it! But maybe you could, too, if you’re a fan! Here are a few samples of my completed layouts from previous weeks. These early weeks were pretty lite while I got the children’s individual lesson plans settled, but I think they give a pretty good idea of the potential anyway. I like the list-it-as-you-complete-it method for keeping track of our Morning Basket reading and work because we may all enjoy a Drive Thru History program together, or a spontaneous rabbit trail which inspires some new researching…and I list it all here. Remember, I only keep track of “together-work” here. Each child has an individual lesson plan (kept on their own clipboard) that lists reading and other work like history, literature, their math, science/nature study, and their own age-appropriate religion/faith reading. Finally, the last set of sheets behind the lesson planning 2-page spread sheets are a set of checklist sheets. When ordering, you have the option to add differing amounts of these sheets. At first, they mystified me – I don’t have any checklists to record – what to do with them??? 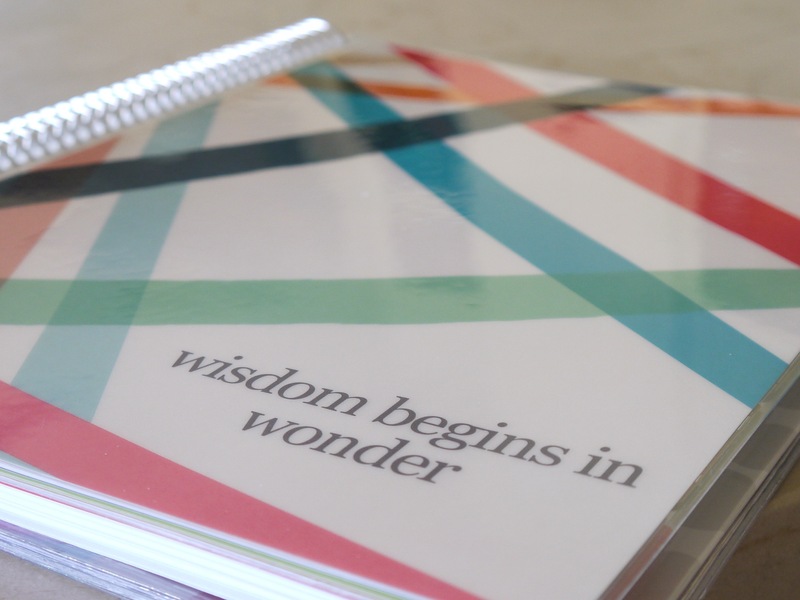 But, really – just think of them as grid pages and you can use them however your imagination dictates! 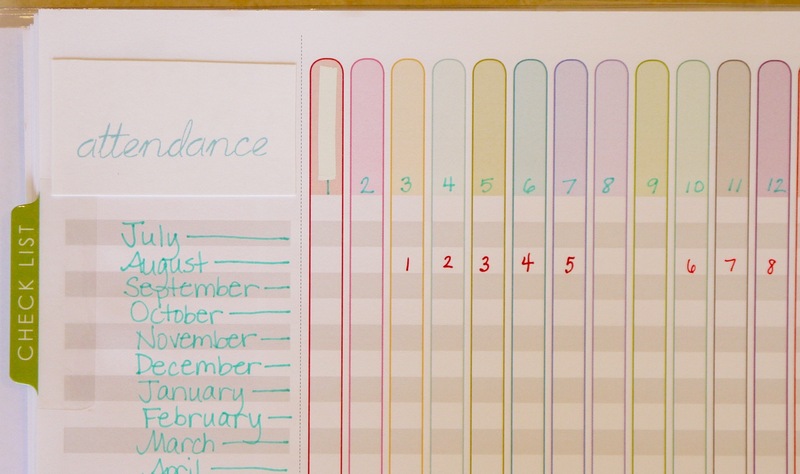 I thought I’d share the example of how I’m using one of the checklist pages as an attendance record, but you can use these checklist pages in so many different ways! Just think outside the box! These pages can hold any sort of list or even simple brainstorming notes! When I’m planning for the week, I pull out my master notebook, and my Erin Condren Teacher Planner, and I have everything I need. I jot down simple plans, and then each day, I journal in the extras. With this, and the detailed lesson plans that I make for each of my children, that’s a pretty full picture of our day. Not every day is ideal, and not every day is lived exactly as it is planned on paper, but with a plan in hand days are smoother overall and we have direction and a form to follow. Check back soon for more in the Morning Basket series! LOVE it!!! 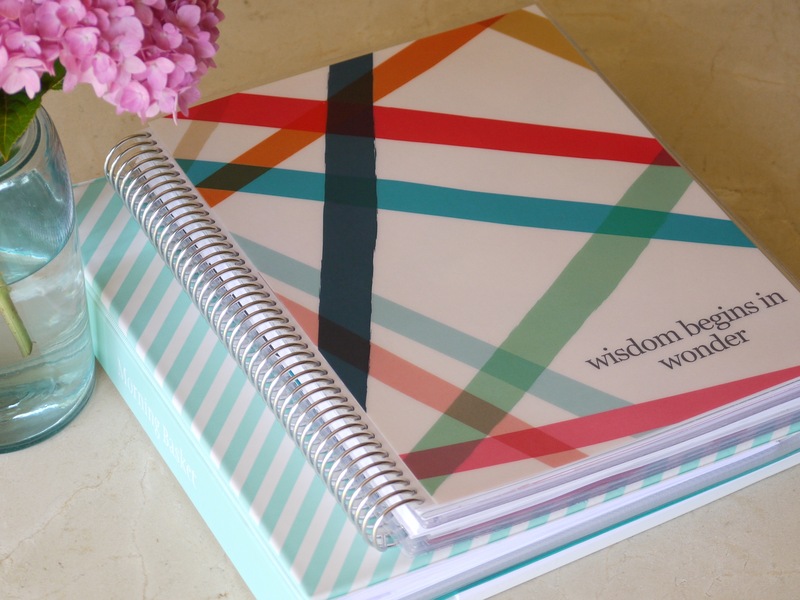 I’m a home school mom of 2 and I also use the Erin Condren planner. 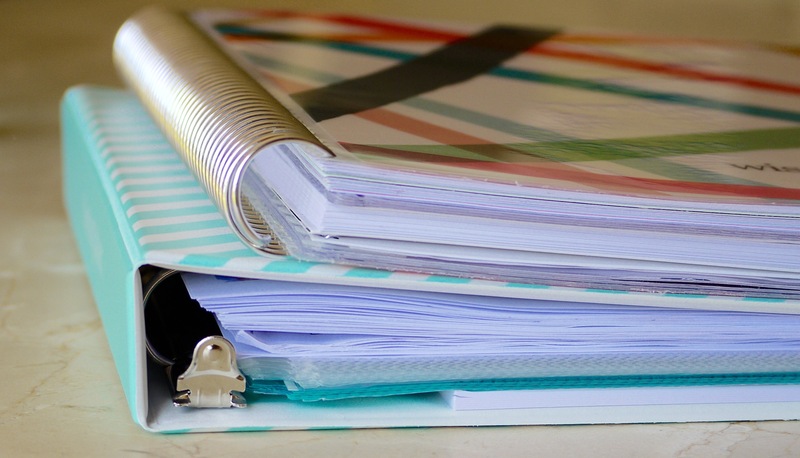 great ideas on uses of some of those random pages we just don’t need. I have started using your Morning Basket ideas with my kids this year (6 kids- senior on down to 2 years old), for just 30 minutes a day, but it is really enriching our curriculum. Everyone loves being together, we are listening to some poetry, doing some art together, journaling,etc. Things I have wanted to do but never find time to do it! Just that small amount of time is making a big difference. Thank you for sharing your ideas! I’m so glad to have your encouragement, Michelle! I think there is an idea that Morning Basket time is kiddy-time…or just for little kids – but actually, it can be so rich with our big kids! And it DEFINITELY WORKS with a tremendous age spread! Actually, it works better than when all the kids were just little! Anyway, I just wanted to encourage you! I really enjoy Morning Basket time with my high school students! Its a fantastic time to grow in relationship with those bigger kids, and they’re such a help in setting examples and helping with training in the little kids! That is what I hope was the problem. I got the first orders faster than expected and I think they just were rushed and missed getting checked. I really want to use their products more in the future. 🙂 I am pulling out the teacher planner and giving it some attention this afternoon. I’ve been using it but not like I had planned . . . . time to get busy! I am familiar with Mater Amabilis, and I do consult their website and their book choices! It’s a wonderful CM curriculum that is a blessing to many Catholic families! Although I do modify Ambleside even when I use it, I find that it tends to fit our family better overall simply because…I already own almost every single book in their schedule – from Year 0-12. Some of those books are also on the Mater Amabilis schedule. Most of the books in my home library I acquired from my mom, after she finished home schooling my brother and sister. Those books line up so well with the rich offerings in the Ambleside schedule. Also, I do find the peer help (in the forum) and the many resources available at the Ambleside website (for example, the Plutarch guides, and the many, many notes shared for the particular books on the schedule) is a tremendous help to someone homeschooling several ages and stages at once. That said, I do need to be careful of some selections, particularly in the area of faith. I substitute all my own books for religion/faith, and I prefer to do that anyway. I do sub some history selections, adding in books that provide Catholic worldview in history, literature, sciences, and other areas that fit. So really, my schedule is a modified Ambleside schedule. In terms of books that are of concern because of our Catholic faith, there actually aren’t many books I need to pull from the Ambleside schedule. Trial and Triumph is most decidedly anti-Catholic and is used in the early years. Since the book offers stories through church history, I find that easy to substitute. Pilgrims Progress is another book we don’t use. It’s easy to substitute something Catholic. Most of the other books are classics and I like the selections. In terms of adding in books from the liturgical seasons, I have always done that within our Morning Basket, and prefer to read those kinds of selections as a family, rather than assigning each child their own particular books. Hope that helps you some, Karen! Yes, it’s very helpful! Thank you so much for such a thoughtful and detailed response! I just sent EC a message asking for a planner that is homeschool friendly. ; ) I also sent them a link to The Simple Plan from Mardel as a good example. 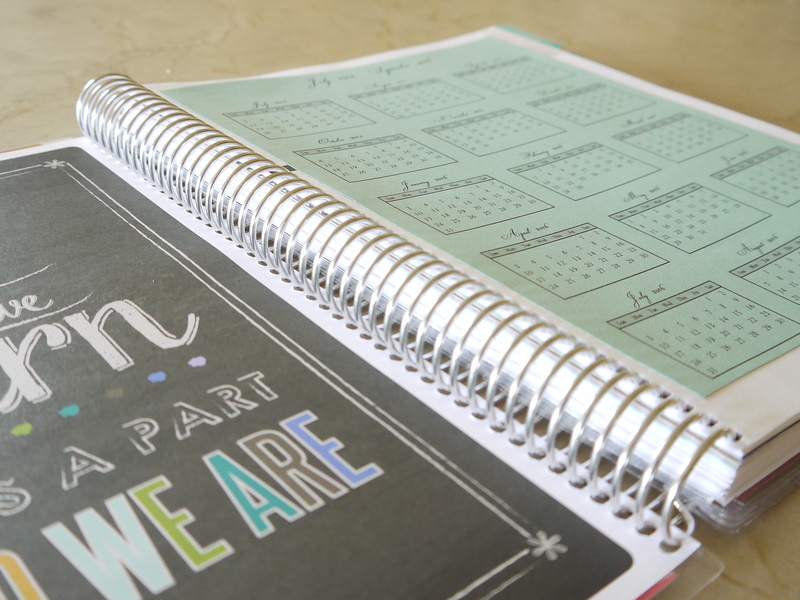 That is my all time favorite (or a least the closest to perfect) for a homeschool planner. I only purchased it once because it did not hold up and we had to find something new halfway through our school year. I’ve been devouring all of your posts on planning and planners (again – this isn’t my first time through!) I was wondering if you would consider showing how you use Pages to layout your children’s individual daily lessons? I would love to see a picture or two, as that is how my brain works! Thank you so much for all the work you put into your blog. I so enjoy all your posts! The idea of the Morning Basket is something you can extend to any student – whether you have one or five. It’s true that I enjoy it because it’s a common point for all of my kids to start their day. But a foundational reason for the Morning Basket is that it fosters the relationship between myself and my students through living, worthy books and our shared faith time reading. This is something that remains regardless of how many students are in the room.